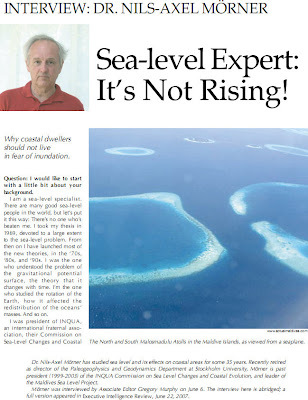 THE HOCKEY SCHTICK: Sea Level Expert: "Sea is not Rising"
Sea Level Expert: "Sea is not Rising"
Dr. Nils-Axel Mörner is the head of the Paleogeophysics and Geodynamics department at Stockholm University in Sweden. He is past president (1999-2003) of the INQUA Commission on Sea Level Changes and Coastal Evolution, leader of the Maldives Sea Level Project. Dr. Mörner been studying the sea level and its effects on coastal areas for some 35 years. "Another way of looking at what is going on is the tide gauge. Tide gauging is very complicated, because it gives different answers for wherever you are in the world. We have to rely on geology when we interpret it. So, for example, ...the IPCC choose Hong Kong, which has six tide gauges, and choose the record of one, which gives a 2.3 mm per year of sea level. Every geologist knows that that is a subsiding area. It’s the compaction of sediment; it is the only record which should not [be used]. And if that [2.3 mm] figure is correct, then Holland would not be subsiding, it would be uplifting. And that is just ridiculous. Not even ignorance could be responsible for a thing like that. So tide gauges, you have to treat very, very carefully." Now, back to satellite altimetry. From 1992 to 2002, [the graph of the sea level] was a straight line, variability along a straight line, but absolutely no trend whatsoever. We could see those spikes: a very rapid rise, but then in half a year, they fall back again. But absolutely no trend, and to have a sea-level rise, you need a trend. Then, in 2003, the same data set, which in [the IPCC's] publications, in their website, was a straight line—suddenly it changed, and showed a very strong line of uplift, 2.3 mm per year, the same as from the tide gauge. And that didn't look so nice. It looked as though they had recorded something; but they hadn't recorded anything. It was the original one which they had suddenly twisted up, because they entered a "correction factor," which they took from the tide gauge. So it was not a measured thing, but a figure introduced from outside. I accused them of this at the Academy of Sciences in Moscow —I said you have introduced factors from outside; it's not a measurement. It looks like it is measured from the satellite, but you don't say what really happened. And they answered, that we had to do it, because otherwise we would not have gotten any trend! Baby steps to a Mea Culpa?